The new allotment site on Marsworth Road, opposite the New May Fu restaurant, opened in April 2010, with 4 extra plots added in 2014. The National Trust has leased the land to Pitstone Parish Council for the sole purpose of providing allotments for village residents. The Pitstone Allotment Association was formed to manage the site on behalf of the parish council. 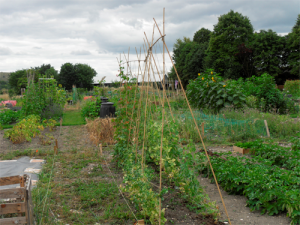 They provide support to all the allotment tenants to ensure they get the most benefit from their allotment plots by encouraging the sharing of knowledge, a love of growing fruit, vegetables and flowers plus social interaction. They arrange a number of open days and special events at the site throughout the year, so that the whole community can benefit from this superb facility. The site is divided into 73 quarter sized plots (which measure approximately 6.25m x 5m or 20ft by 16ft) and residents can request up to 4 plots, subject to availability. All plots are currently occupied and a waiting list is in operation.